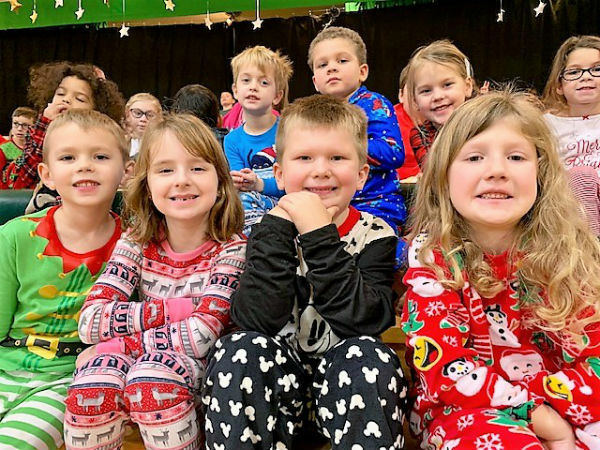 Students at Erie's St. Luke School during a special pajama day in December 2018. Photo by Erica Erwin. What is it about Catholic schools that make them special? A challenging academic curriculum? A focus on faith and character? The community they foster? Catholic Schools Week, Jan. 27-Feb. 2, celebrates all the above. Schools throughout the 13-county Diocese of Erie will observe the week with special Masses, open houses and activities that celebrate parishes, communities, vocations, students, and faculty and staff. It’s a chance to shine the spotlight on the diocese’s commitment to providing students with an excellent education in a faith-rich environment, said Father Nicholas Rouch, vicar for education. Many schools are holding open houses on Sunday, Jan. 27, to kick off the week, an annual celebration sponsored by the National Catholic Education Association. Among the other events: a “God Made You Special” talent show at St. Boniface School in Kersey, a “Time Out for Christ” service day at Seton Catholic School in Meadville, and – sorry, teachers – a “Pie the Teacher” fundraiser at Erie’s St. Jude School. DuBois Area Catholic Schools have a slate of events planned, including a weeklong visit from the Mobile Ag Ed Science Lab, a 40-foot trailer sponsored by the Pennsylvania Farm Bureau that serves as a classroom on wheels. DuBois Central Catholic Elementary School students will have the chance to participate in hands-on experiments and lessons on agriculture. Many of the schools, including those in the DuBois system, will hold school- or system-wide Masses. Jim Gallagher, superintendent of schools, said he hopes the week’s events help current parents and students take pride in being part of both a school family and the universal Catholic Church. To learn more about what a Catholic education has to offer, visit the Catholic Schools Office. Find a list of open houses at diocesan schools here. For more on Catholic Schools Week, click here.